Natto is a traditional Japanese food of fermented soybeans. Natto soybeans are steam-cooked and then fermented with a healthy bacteria known as Bacillus subtilis. The fermentation process yields food that is high in nutrition and protein. At first glance, natto appears to be light to dark brown, with beans that are quite small. It has a strong odor and a strong flavor which makes natto somewhat of an acquired taste. The texture of the beans is medium-firm but soft in the center. Due to the beans' fermented nature, they are slimy, with long stretchy strings that take some maneuvering to eat. To round out your meal, consider serving any or all of these optional condiments and garnishes alongside the natto and rice: dried bonito fish flakes, kizami nori (thinly sliced dried seaweed), karashi (hot Japanese yellow mustard), wasabi (fresh hot horseradish), sliced green onions (negi), and sliced fresh shiso leaves (perilla). Place the hot cooked rice in a large rice bowl. In a small bowl, combine two packets of natto (fermented soybeans). If the package comes with packets of seasoning sauce and karashi (hot Japanese yellow mustard), add the contents to the bowl. Mix vigorously with chopsticks. Add in favorite garnishes to the natto. Additional soy sauce may also be desired, to suit individual taste. Any number and combinations of the above-suggested garnishes may be added into the natto mixture. Next, top the steamed rice with the mixed natto, and add extra garnishes as desired. Eat immediately. One variation is chopped natto, marketed as hikiwari natto, where the soybeans are chopped before fermentation. Another variation is kotsubu natto, which are fermented soybeans that are smaller than what is considered typical. Natto is sold prepackaged into small 40- or 50-gram packets and sold in packs of three to five packets. It is available for sale in the refrigerated section of Japanese and other Asian grocery stores. Unopened natto packages may be stored in the freezer for a short period of time. In Japanese cuisine, the most basic way that natto is enjoyed is served over hot steamed rice. This way of eating natto is quite traditional, and it is often eaten for breakfast. 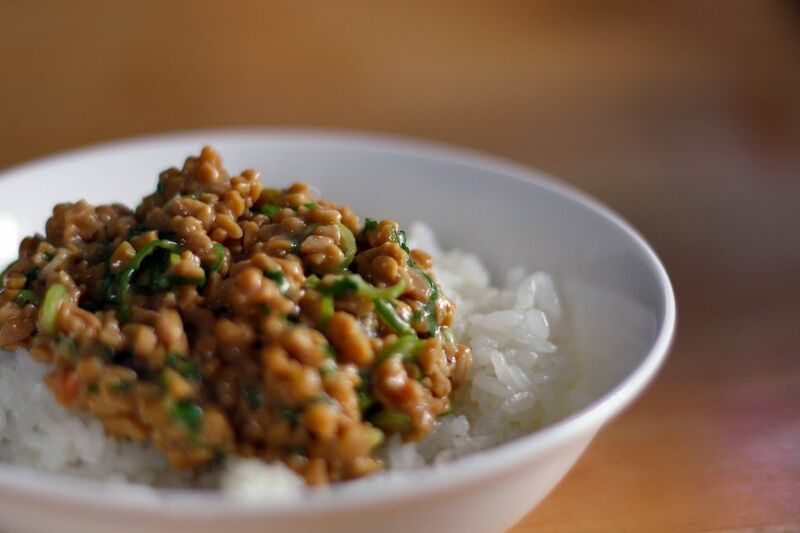 Other times where natto over rice is enjoyed is as a snack, side dish, or even as a quick and easy meal.